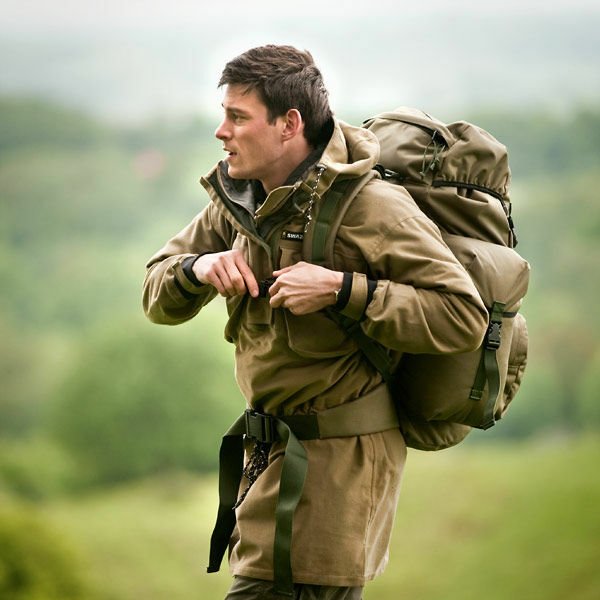 The Ray Mears Leaf Cutter Rucksack is the first ever rucksack to have been designed and tested by the British Bushcraft and survival expert Ray Mears. The end result is a dedicated outdoor pack that is spacious and tough, yet surprisingly light in weight. Each pack has been crafted from start to finish right here in the UK, courtesy of Scottish Mountain Gear - a company with whom Ray has had ties since as far back as his Bushcraft Survival days. Indeed, the Leaf Cutter was developed from a custom jungle rucksack, made for Ray by Scottish Mountain Gear many years ago. 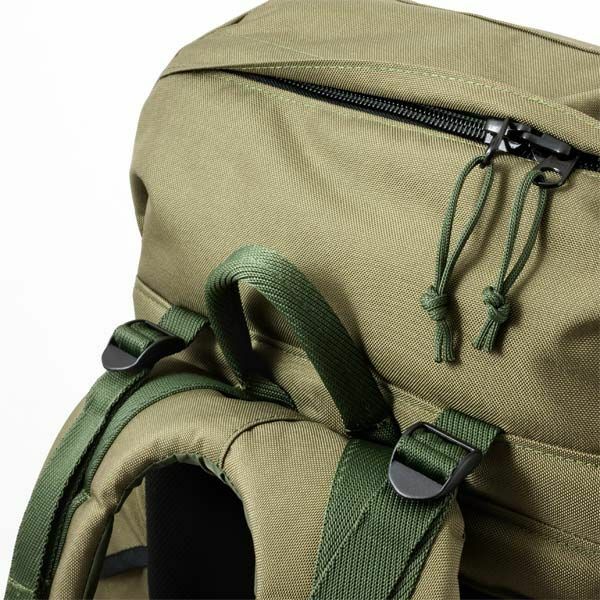 When first setting out to design this rucksack, Ray's primary goal was to create "a pack that you can live out of." With its focus on roomy, easy-access compartments, along with strong fabrics and fittings, this is a pack that does away with the unnecessary gimmicks and instead provides a reliable and durable companion for your adventures. With a main compartment volume of 58 litres, the pack provides ample space for your equipment, clothing and food, making it perfect for week-long forays or even longer trips into the wilderness. Despite this large capacity, the pack weighs in at just 1.8 kg; a surprisingly low figure for such a spacious rucksack made from strong fabrics. It is thanks to this that the rucksack's name was born, after the supremely strong yet agile leaf cutter ant. 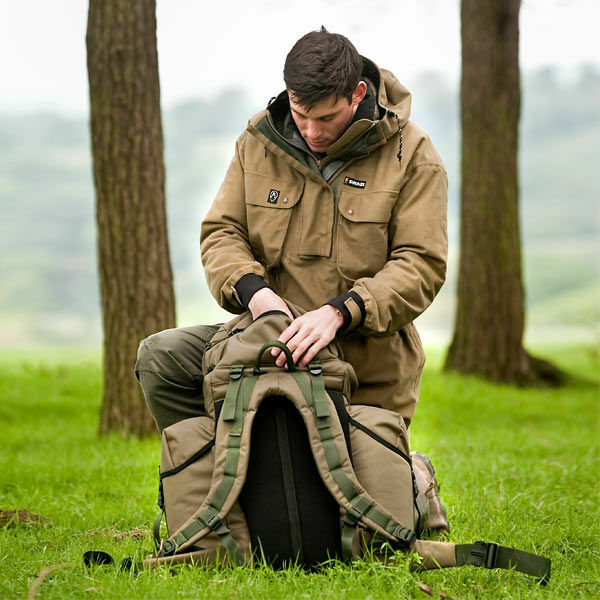 The fixed side pockets provide an additional packing volume of 20 litres, helping you to organise your gear while keeping important items close to hand. An external pocket on the front of the pack provides plenty of room for your first aid kit, while two internal sleeves in the main compartment provide the perfect storage space for a pair of SAM splints. 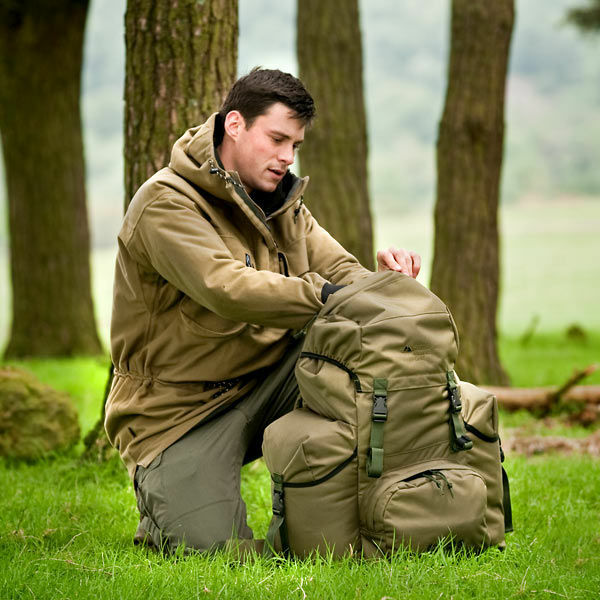 Ray Mears Leaf Cutter Rucksack is rated 5/5 based on 32 customer reviews. 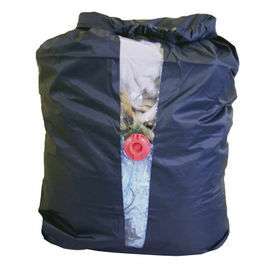 The bag is very simple but well thought out, it is lightweight and tough it holds a lot of gear. I am 6ft1' and the bag fits me fine, the only change I would make to this bag is snow covers on the side pouches. 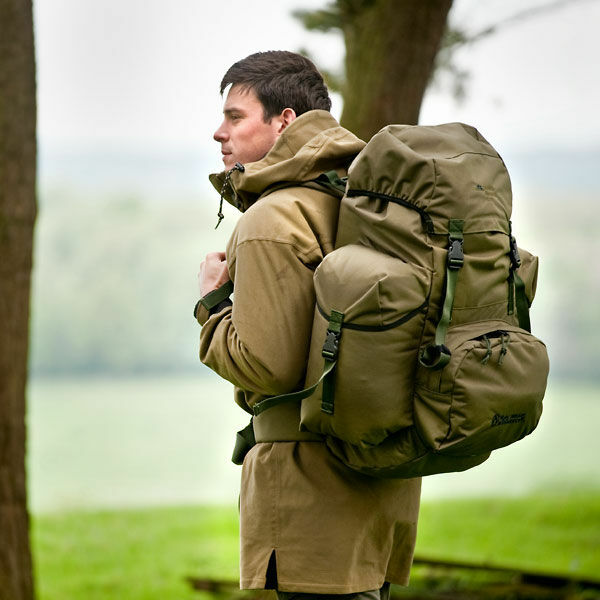 You have to think out your kit before you buy this bag as I see a lot of people strapping extras to the side of packs, you cannot do that with this pack as it lacks any tie points. In all a great pack, which I would recommend. I haven't owned this pack very long but, I have taken it on about 8 single day snowshoe trips in the Colorado Rocky Mountains. First, I want to start of by saying this pack is very light by itself. When loaded it is very well balanced and comfortable.There is plenty of room for all the bulky winter clothing and gear. Yesterday, it was put to the test and it passed. I was out snowshoeing for 9 hours with constant wet snowfall. I had no dry bag over it and the outside of the pack was soaked. All my gear and extra clothes remained dry inside. I had to change my middle layer cap and gloves once as well as throwing my wet tarp into the main compartment. After the trip I took all my soaked clothing out and the inside was pretty wet but it and the outside dried within a couple of hours. I do alot of winter trips and this bag is great for all the gear needed to stay safe and comfortable in the winter. I also travelled a total of 14.5 km in approximately 1.5 m of deep snow with a load of 18 kg and had no discomfort from the pack. 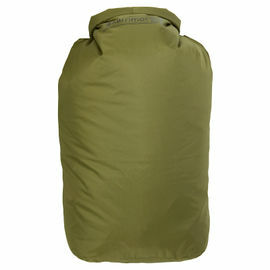 My only complaint and it's more of a personal problem, I have a quite bulky sleeping bag (rated -30 F) and it is too big to fit in the main compartment I wish the pack had lashing points but I can easily modify it. Overall it is a very great and versatile pack I am extremely satisfied. This will be the last day sack I ever buy. British made, quality item. 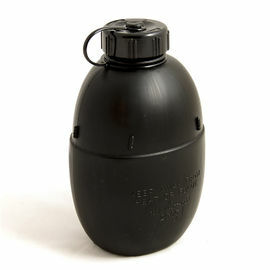 Perfect for the outdoors and bushcraft. Nice and lightweight, well constructed and the pockets in the right places. There are no unnecessary straps or loops on the bag. Buy one they're amazing and worth every penny. Used this first on an expedition leader course and I am very impressed. Very well made and not over complicated. Very comfortable to wear whilst carrying all my kit over 3 days. Love it! And it is made in UK. 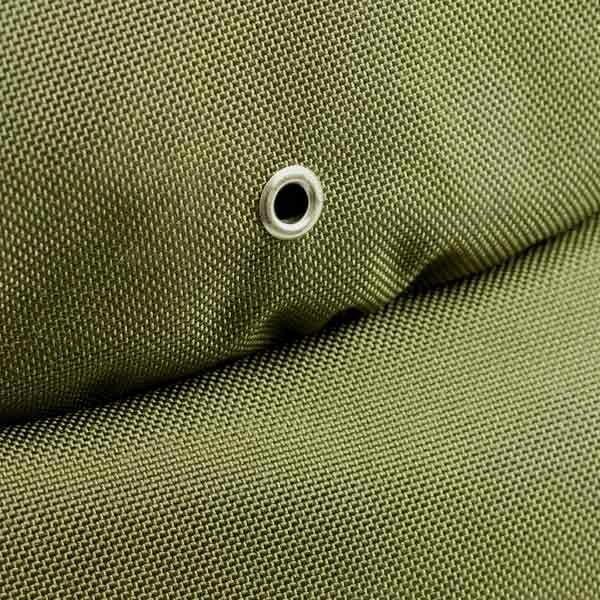 Built to last, the main compartment is very spacious along with the the side pockets and front pocket. Love this backpack. I took a gamble when I purchased this rucksack and I'm happy to say I'm not disappointed. I live 15 minutes from a major high quality outdoors retailer with a well deserved, excellent reputation. 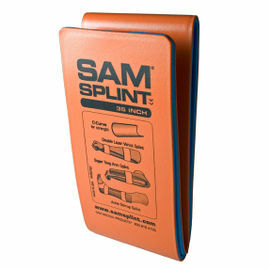 They carry excellent packs with good reviews and decades of use. But my backpacking style is evolving so I wanted a more bush craft oriented pack and the Leaf Cutter's simple straight forward design fits the bill. The first thing that I noticed about the Leaf Cutter is how lightweight it is for it's size and robust construction. It weighs less than some modern packs that are popular with AT thru hikers. Next it fits well and is comfortable! I'm 6'3', 275lbs with a torso length of 20in and it adjusted to my frame easily. This pack could go on someone a little taller without a problem. I've only managed to get one overnight trip since getting the pack but it carried a 35 pound load out easily, (bulky winter gear) and can easily hold more than I should rationally carry. I'm used to an 80-110 liter pack for winter, but more modern gear and better bush craft skills have made that pack too large to be practical accept for longer trips. The Leaf Cutter holds plenty but an assortment of small bags and compression sacks to keep things organized came in handy. The only con is the lack of any external attachment points. I'm used to recreational packs and some military designs so this is a change. Also I don't sleep well in a hammock, I've tried, so I need a sleeping pad. They're very light but don't fit well inside the pack. Putting the pad under the pack lid is adequate but not as secure as I'd like. I'll keep working on it, worst case scenario is to go to the aforementioned retailer the next time they're having a sale and buy an inflatable pad. So it's not a serious problem. Besides, bush craft is about adapting. Suggestions welcome. Overall it's a well thought out design, rugged, comfortable and simple. I see the Leaf Cutter as my new 'go to' multi day pack and can't wait to take it out again. I love this pack! The first day I got it I put 30 lbs in it and did 3 1/2 miles. Very comfortable and I can't believe how light it is. The material is nice and thick. Hope to have Grand kids enjoying this pack one day as it will probably last a lifetime . 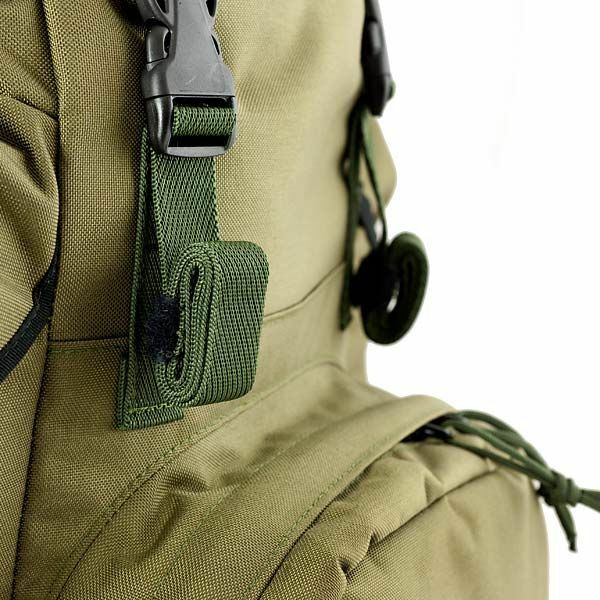 It was not too difficult to choose this item, I needed a larger rucksack that had some large external pockets and still had a generous main body for bulkier items, every part of this has a purpose, there are no extra straps or webbing to add weight or become a nuisance. The side pouches are generous and easy to access with just the clips and strap, and the external main central pouch is large enough for any items you want to get in a hurry with the addition of lockable zips. Keeping it a simple one piece unit is a great idea and really keeps the weight down. I especially like the internal long pockets for an axe or a Boreal 21 inch saw. The material cloth and make up of the bag have been seriously thought out and the quality shows. This may be the last rucksack you will ever need, I know that every time I take this out it will not let me down, even with the weather here in the west of Scotland. This pack is perfect for my needs. Plenty of room for winter gear but equally adaptable to summer use. Construction is good with no frivolous bells and whistles. Its been comfortable to wear both for short and long outings. Excellent piece of kit. A must-have item.